A weak earnings report led to a quick haircut, and the stock failed to recover later in the month. What's ahead for this innovator's lumpy business? What: Shares of next-generation display and lighting technologist Universal Display (NASDAQ:OLED) fell 22.8% in August, according to data from S&P Capital IQ. Other than following the generally downbeat swings of the larger market, Universal Display's month was punctured by a disappointing second-quarter report. So what: Sales decreased 9.4% year over year to $58.1 million, below Wall Street's consensus estimates of $63.3 million. On the bottom line, adjusted earnings per share fell from $0.44 to $0.41, also below the analyst target at $0.45. And that was after backing out a $33 million writedown of unsold inventories, as a new generation of OLED host materials effectively made the older version obsolete overnight. Now what: To be clear, the loss of green host material sales will not be replaced by another such material of Universal Display's design. The company does have newer versions of this important product on tap, but there is no guarantee that device makers will choose that product in upcoming designs. Largest customer Samsung went with a solution from in-house materials developer Cheil, which raises the bar for earning that particular contract back. The obsolete host material was a first-of-its-kind type of product, designed in a hurry to have a quick solution paired with the then-new green phosphorescent emitter materials. Now, green emitters have matured into a standard business and made up 24% of Universal Display's total sales in the second quarter. So going forward, there will be plenty of opportunity to develop and sell more advanced green host materials. So August was a rough patch for Universal Display and its investors, but that second-quarter report didn't reveal any fundamental flaws in the company's business model. It's just a short-term matter of reworking the materials stack for green OLED display elements. 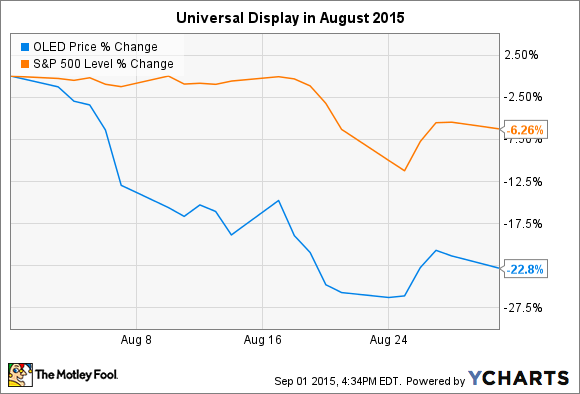 Even after that painful drop, Universal Display shares are trading 30% higher year to date. Supported by reasonable price to free cash flow and forward-looking P/E ratios, the stock still looks crazy expensive based on trailing price-to-earnings metrics. This is not a stock for the risk-averse or deep-discount value investors among us, but I remain excited about Universal Display's future as OLED lighting panels and big-screen televisions work their way into the mainstream markets.